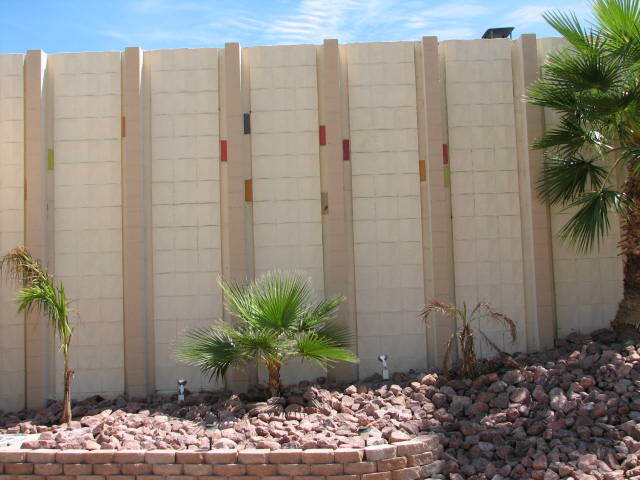 Uncle Jack's Very Vintage Vegas – Mid Century Modern Homes, Historic Las Vegas Neighborhoods, Las Vegas History and Urban Living by Jack LeVine – Throw Back Thursday – Where Did Elvis Go When He “Left The Building” in Las Vegas? Once upon a time, there was an amazing hideway that was owned by the International Hotel, which later became The Hilton Hotel. They used it as a private, exlusive retreat for the headliners. Elvis slept there. So did Dean Martin, Tonya Tucker and many others. 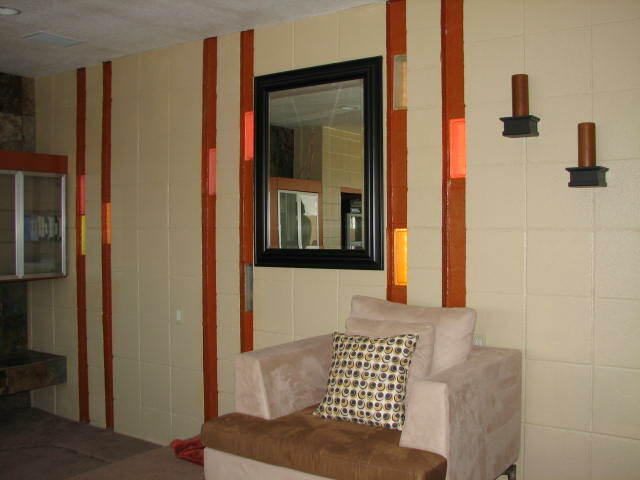 It’s always been referred to as “the Elvis House”. My mother drove me by it and told me the story during one of my first visits to Las Vegas in 1975. I’ve never verified any of the details of the history or the folklore, but even then she told me it was one of the private hangouts for all kinds of strip entertainers. The Hilton sold the property in 1974 to Joseph Macchiaverna, a violinist (who doesn’t have even a single google hit. Anyone know anything about him?). In the 90’s they subdivided the property and built the infill “villas” that surround it to this day. The brief third owner, Michael Michaels, was an Elvis impersonator himself, according to the current owners who acquired the proerty in 2006. 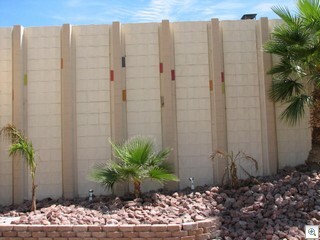 At the time, it was all by itself out in the desert near what would become the intersection of Eastern and Desert Inn. Like everything else in Las Vegas, it was encroached upon by more development. 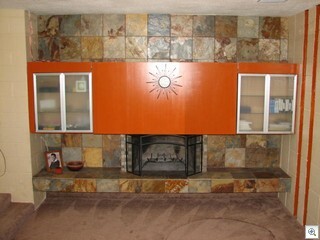 It’s still a little island of mid mod paradise on an 17000+ foot lot. It’s been listed for awhile. 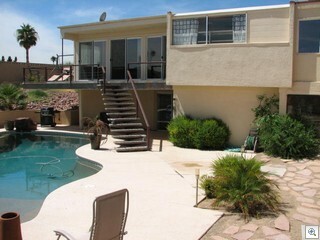 I didn’t pay it much mind when it was $700,000 but the price was just dropped to $410,000 subject to shortsale rules. I thought you’d like to see the pictures, and if you’re into something really crazy and off the wall, as well as off the beaten path, I’d be happy show it to you. The colorful blocks in the face of the home are actually colored glass which lite up the living room. 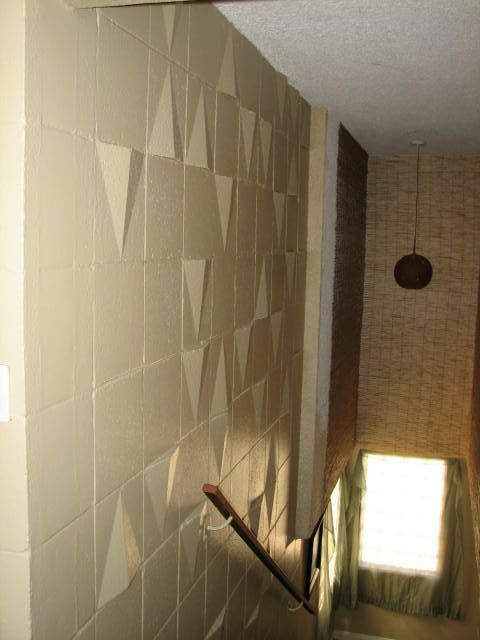 There’s been a lot of use of slate tiles in the home. 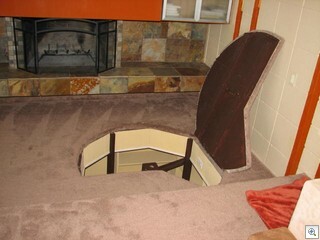 They’re on the front, as well as the stairs, fireplace and flooring. 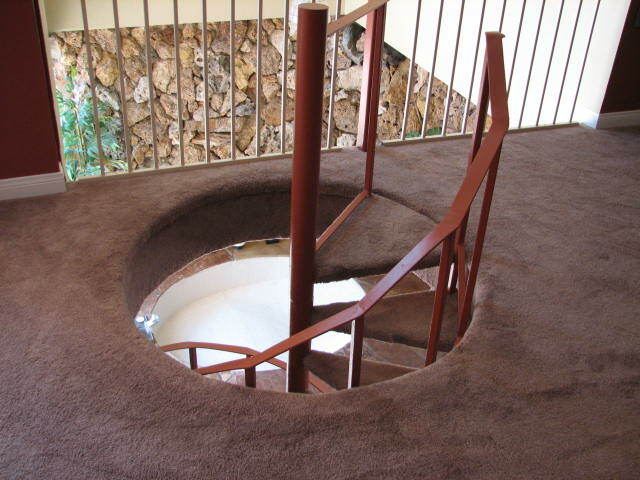 There’s 2 circular staircases in the home. One leads up from the “music room” thru a trap door in the floor in front of the fireplace. 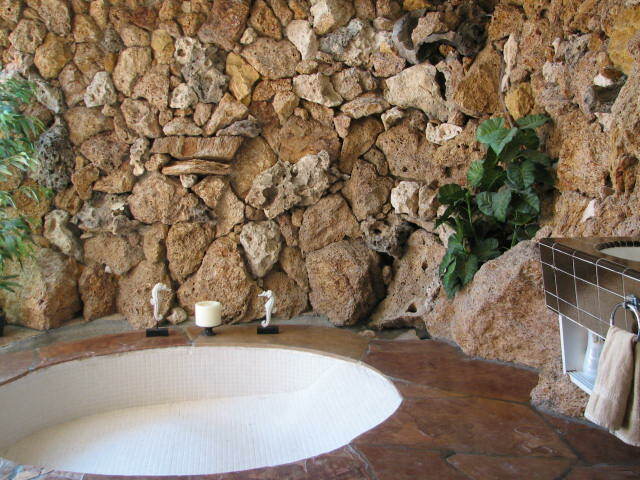 The master bathroom is a 2 story atrium of glass and Lava Rock which also is accessed by a circular staircase up to the master bedroom. There just wasn’t a good angle to show it, but the white oval in the middle of the staircase is actually the master tub. 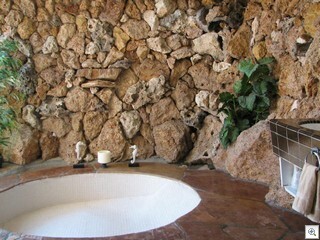 The garden tub in the master bath is surrounded by the lava rock waterfall. 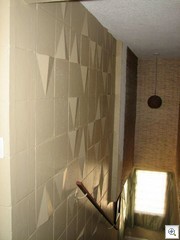 The original pyramid shadow block is used on the stairway, leading up to the kitchen and living area. 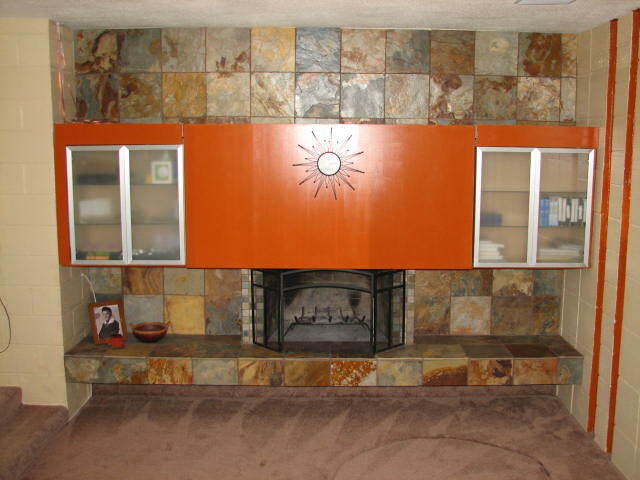 The living room and kitchen as well as the bedrooms are all on the upper level of the home. 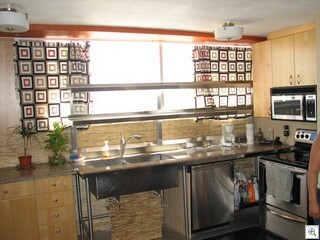 The kitchen is updated and very functional with double fridges, and stainless steel appliances. 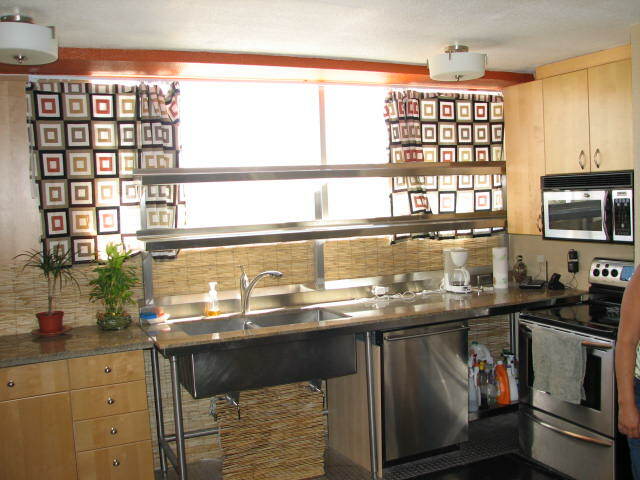 The stainless steel kitchen sink was salvaged from _________hotel kitchen. They told me which one, but I forget. (I know…shame on me, but I’ll call the seller for a reminder and fill in the blank).